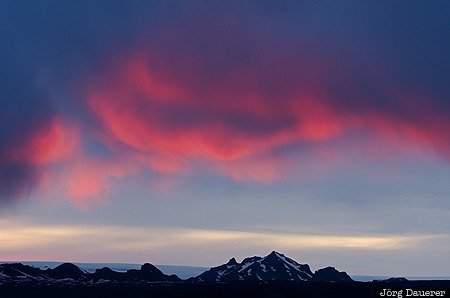 Colorful clouds above the snow covered mountains of the highlands of Iceland near Gullfoss waterfall as the midnight-sun is setting. Gullfoss is in Suðurland in the south west of Iceland. This photo was taken in the early morning of a sunny day in June of 2012. This photo was taken with a digital camera.